Empire Cinemas commissions the world’s first ever ant film premiere for the Leafcutter Exhibition at London Zoo in advance of the release of Marvel Studios’ Ant-Man on July 17th 2015. 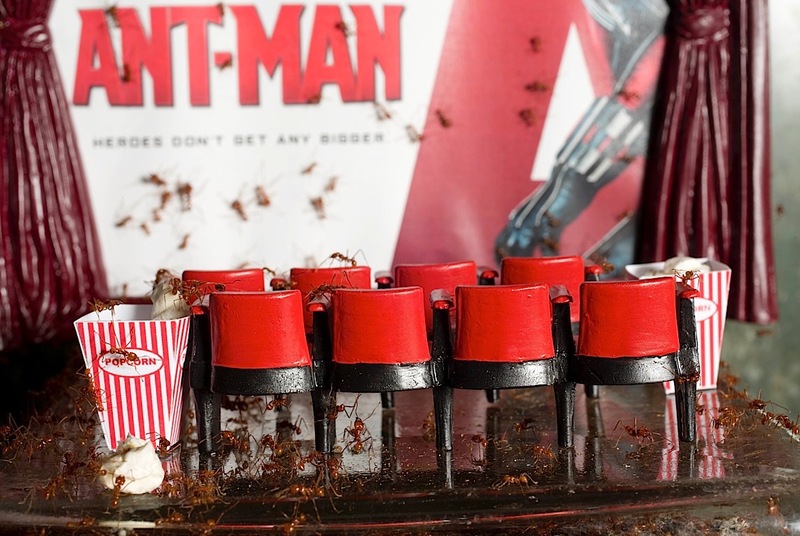 In an important world first, Empire Cinemas threw the first ever film premiere for ants with a screening of Marvel Studios’ Ant-Man for the leafcutter ants at London Zoo. Bringing the antics to the eusocial insects they took a miniature screen, two speakers, eight seats, branding board, red carpet and popcorn to London Zoo’s leaf-cutter exhibition, and transformed into a small-scale cinema for this fantastic unique event. The leafcutter ants, which can grow up to 1cm in size in their lifetime, attended the film in true premiere style and posed with their leaves for photos in front of the brilliant Empire Cinemas miniature branding board and red carpet. The hard-working insects then proceeded to crawl over the seats, popcorn holders and even the screen before the film began. No ants were harmed at the premiere. Ant-Man, with its stellar cast including Paul Rudd, Michael Douglas and Judy Greer, tells the story of a con man with the ability to shrink in size but grow in strength, who must help his mentor protect the secret of his Ant-Man suit and pull off a heist that will save the world. The film, which screens in Empire Cinemas from July 17th (available in IMAX 3D format in Birmingham and Basildon), was produced by Marvel Studios and distributed by Disney. Ant-Man will screen at Empire Cinemas from July 17th – www.empirecinemas.co.uk or call 08714 714 714. For further ticketing information visit www.EmpireCinemas.co.uk or call 08714 714 714.